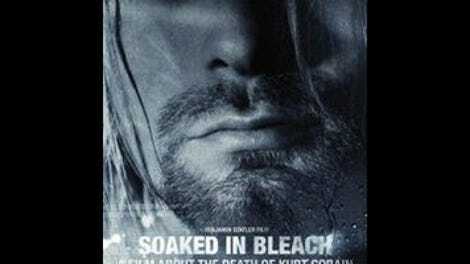 Soaked In Bleach stops short of flat-out stating what it wants to, presumably for legal reasons, which is that somebody—likely nanny Michael “Cali” DeWitt—murdered Nirvana’s Kurt Cobain at the behest of Cobain’s wife, Courtney Love, and made it look like a suicide. That theory isn’t new, nor is much of anything in Benjamin Statler’s documentary, but it does present the facts (both disputed and undisputed) in a manner more succinct than they’ve been presented before, at least on film. (Go ahead and cast a sideways glance at Nick Broomfield’s self-serving Kurt & Courtney.) And if it doesn’t lead people to believe that Cobain was murdered, it might achieve its secondary goals—to at least nudge them toward the possibility, and to get the authorities to consider re-opening the case. It’s intended as a call to action, not just a salacious re-hash. The film mostly centers—as all talk of Cobain’s alleged murder does—on Tom Grant, the private investigator hired by Love to find Cobain after he left an L.A. rehab facility and returned to Seattle in April 1994. The most damning evidence that Grant collected around this time involves the couple’s lawyer, Rosemary Carroll, who told Grant that Kurt had recently asked her to remove Courtney from his will, and that Courtney had asked her to locate “the meanest, most vicious” divorce lawyer she could find. Carroll also showed Grant a piece of paper, allegedly from Love’s backpack, that appears to be someone practicing how to copy Cobain’s handwriting—all the better to add some damning lines to the supposed suicide note, which itself would never have been seen publicly without Grant. Unless Carroll was flat-out lying—which seems unlikely—the marriage was in serious trouble, a fact that’s been glossed over by the official record, including the recent Montage Of Heck. But while the idea that they were about to split does offer motive—Love also allegedly asked Carroll if it was possible to cancel her prenuptial agreement with Cobain—it doesn’t prove murder. That’s where things get blurrier in Bleach, with evidence offered by expert witnesses that a) Cobain had so much heroin in his system that he couldn’t possibly have even picked up a shotgun, b) the way Cobain was gripping the gun made no sense, and c) the investigation itself was far too quick and neat to have been effective. The film makes a compelling case for all of those things, and perhaps even more importantly, it lets Love herself make the case that she’s a terrible, deceptive person. Grant recorded all of his calls with Love, and in the movie’s most questionable choice, Statler uses dramatic reenactments for conversations between the investigator and Love, with a negligee-wearing Sarah Scott emanating evil as Love and character actor Daniel Roebuck playing Grant as the no-nonsense P.I. It’s Lifetime-level stuff, and while inserting bits from the actual audio into the actors’ mouths is an interesting choice, it’s ultimately a little distracting. Still, Soaked In Bleach counters that salaciousness with believable, credentialed talking heads, most notably Norm Stamper, who was Chief of the Seattle P.D. at the time of Cobain’s death. He, along with some forensics experts, believe that the case should be re-opened—that the determination of suicide (which was made the very day Cobain’s body was discovered) was too hasty. Soaked In Bleach also purposefully avoids some of the wackier conspiracy theories around Cobain’s death, choosing instead to treat it like a serious investigation—which is how it started. And whether he’s way off base or not, Tom Grant is clearly a believer, and the ideas he presents via Soaked In Bleach—as unabashedly one-sided as they are—aren’t easily dismissed. Soaked In Bleach is available now from Vimeo On Demand and is playing in select theaters.